The Skulpturensammlung is one of the largest collections of ancient sculpture in the world and is housed in the Bode-Museum on the Museumsinsel Berlin. The sculptures range in date from the early Middle Ages to the late 18th century and come from the German-speaking countries, France, the Netherlands, Italy, and Spain. 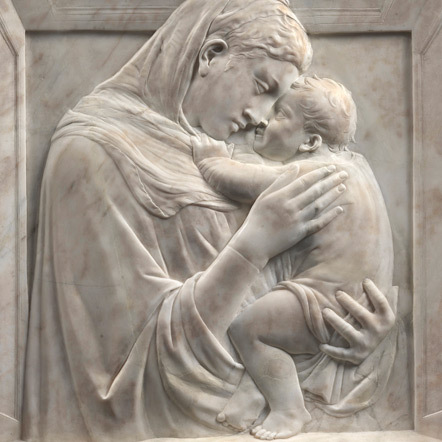 Visitors are greeted by a wonderful variety of Italian masterworks, starting with medieval sculptures such as the Madonna by Presbyter Martinus and the 'Man of Sorrows’ by Giovanni Pisano, and leading to works by masters of the early Renaissance. Glazed terracottas by Luca della Robbia, Donatello’s 'Pazzi Madonna’, and the portrait busts of Desiderio da Settignano and Mino da Fiesole form particular highlights in the collection. Equally impressive are the German late Gothic sculptures, including such arresting works as Michel Erhart’s 'Madonna of Mercy’ ('Schutzmantelmadonna’) and sculptures by Hans Multscher, Niclaus Gerhaert von Leyden, Tilman Riemenschneider, Hans Brüggemann, and Hans Leinberger. These are followed by works from the German Renaissance and Baroque periods, including small sculptures carved from alabaster and ivory. The collection ends with the particularly striking monumental warrior saints by Martin Zürn, dating from the time of the Thirty Years’ War. 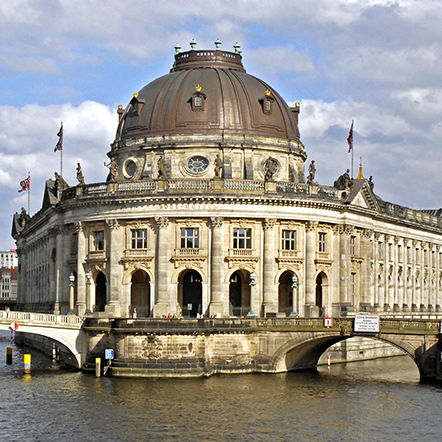 The Bode-Museum also boasts impressive examples of architectural sculpture. The Romanesque tribune from the Abbey Church in Gröningen, with its finely detailed figure-carving, is one of the German masterpieces of the period, while the animated sculptures of Andreas Schlüter and the group of six statues of military commanders, specifically made for the former Wilhelmplatz in Berlin, are representative of Berlin statuary of the 17th and 18th centuries. Rococo and Neoclassicism in Germany are exemplified with works by Ignaz Günther, Joseph Anton Feuchtmayer, Edmé Bouchardon, Pierre Puget, und Jean-Antoine Houdon. One room adjoining the balcony of the Great Dome is dedicated to James Simon, the most important patron in the history of the Berlin museums, who endowed the Kaiser-Friedrich-Museum/Skulpturensammlung with his important collection of medieval and Renaissance art. On the opposite side of the balcony stands a cabinet whose display commemorates the fires that engulfed the 'flak bunker’ in Berlin-Friedrichshain in May 1945, resulting in the severe damage or total loss of many of the Skulpturensammlung’s works. On display for a period of three years is the Würth Kunstkammer, comprising 28 loans from the collection of the industrialist and contemporary patron of the arts Reinhold Würth, in a remarkable example of the commitment to the arts made by private individuals today. The loans are mainly small ivory pieces by 17th and 18th century artists such as Leonhard Kern, Zacharias Hegewald, Joachim Henne, Adam Lenckhardt, Paul Egell, and Christoph Daniel Schenck. Other highlights are a valuable 17th century amber altar and a silver sculpture, partially gilded, by Paulus Ättinger, representing Diana riding on a stag. The Gobelins tapestry room is only open on weekends and public holidays. The upstairs galleries of the permanent exhibitions including the exhibtion "Syria Antiqua - Coins and Monuments on the Museumsinsel" open at 11:00 a.m.